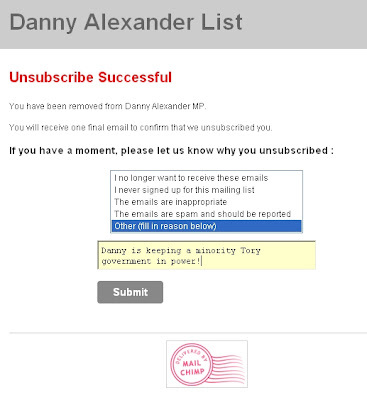 This observer never used to mind the yearly e-mail from Danny Alexander but thought it might be time for another New Year resolution. I unsubscribed from the Danny spin emails post the Lib Dem coalition but still got one from him today. I had an idea it was illegal to keep sending out emails once you had unsubscribed? Maybe he just can't believe anyone would want to unsubscribe! He once asked to be my friend on Facebook. I thought that was cool and I said yes but since then I have defriended him.